He fled the Oakland Raiders, got grand-jury clearance on felony "purple drank" havin' charges and has "John Lucas Basketball Resources" doing some PR. Aw yeah, JaMarcus Russell is back in tha game, yo! 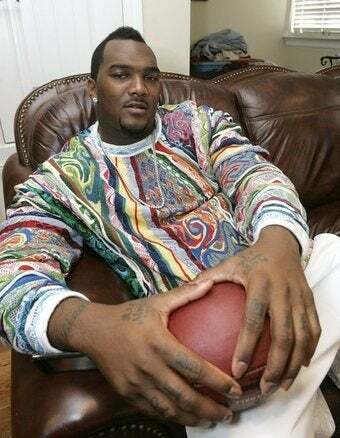 Houston, Oct. 30, 2010 - A grand jury in Alabama has declined to indict JaMarcus Russell following the investigation of a drug charge. Russell was charged with felony possession of a controlled substance, a drink containing codeine syrup. The defense contended it belonged to another person in Russell's home. With no ability to show evidence to indict, the grand jury had no other choice, but to pass on trying Russell in a court of law. • Russell is working out and the dismissal of the case allows Russell to proceed with his plan to return to the pros. • "I am happy to hear of the decision that I won't be charged with anything related to what happened in Mobile. As I stated from the beginning, this was not who I am and today only proves that. This was a simple roadblock in my quest to return to the game I love. This allows me to concentrate on the areas of my life that are real and have a need for my attention. You have not heard the last of JaMarcus Russell playing in the NFL." • Russell is currently enrolled in the Athletes After Care Program designed by John Lucas of John Lucas Enterprises. Russell works six days a week ... and his desire to reemerge into the NFL has not gone unnoticed. "This will allow JaMarcus some breathing room and let him concentrate on what is most important to him and his family," said John Lucas of John Lucas Enterprises. "He has capitalized on everything offered. JaMarcus is a true warrior and a man of great faith in God and his abilities." • Russell now looks to his future of leading an NFL team as their franchise quarterback.